No one in their right mind would jump into the mouth of a great white shark but this one sure would be fun because it's an Inflatable shark. Get a running start and jump right into his big wide mouth and slide down the super fast throat of this great white shark. Don't worry, we have his mouth wired open so he doesn't bite. 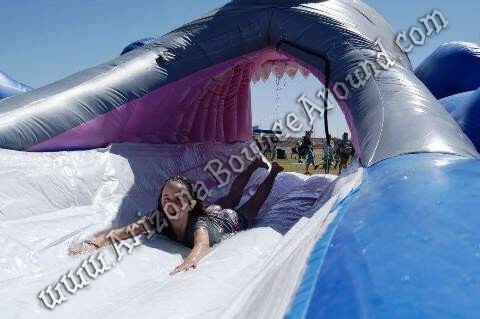 Kid's and adults will love this new Inflatable Shark slip and slide. Not only does it look amazing but it's 14 feet tall. Add a mechanical shark for the real Shark week party or event in Colorado.